In 1916, the Moose Hill Bird Sanctuary was established in Sharon, Mass., after Dr. George W. Field gave his estate to Mass Audubon with the goal of attracting birds and people interested in them. Today there are 56 Mass Audubon wildlife sanctuaries located around the state—and spring is a great time to introduce, or reintroduce, your kids to birds and birding (suggestions on where to go birding with kids below). 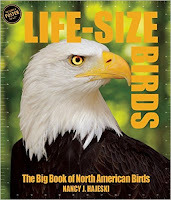 To get your kids interested in and excited about birds, I highly recommend Life-size Birds: The Life-size Book of North American Birds, just published last winter by the longtime birder Nancy J. Hajeski. The amazingly gorgeous and detailed oversized book (14 x 12 inches) features life-size photographs, a “Fact File” panel with bird stats including length, wingspan, and weight, as well as the best times for birdwatching. It’s a great resource and while not written specifically for kids, it will draw their attention—and it's fun to peruse together. Mass Audubon is celebrating its 100th anniversary on Saturday, April 9, 2016, with free admission at most of its sanctuaries, guided nature walks, and family friendly activities. Naturalists will guide explorations of local habitats on beach walks, trail hikes, and along mountain peaks. There will be nature-inspired games and scavenger hunts, animal-inspired arts and crafts, and pond and wildlife observation. Visit the Mass Audubon website for a free ticket. The Norman Bird Sanctuary on Aquidneck Island offers free guided bird walks every other Sunday from 8 to 10 a.m. Established in 1949, Norman's mission is to maintain the land “for the propagation, preservation, and protection of birds, and where birds and bird life may be observed, studied, taught, and enjoyed by lovers of nature and by the public generally so interested in a spirit of humanity and mercy.” In other words, it’s an ideal place for kids to learn about our feathered friends. Maine Audubon hosts a Spring Owl Show with Birdsacre at Fields Pond at 10:30 a.m. and 1:30 p.m. on April 30, 2016. Visitors will meet Grayson from Birdsacre in a live owl show featuring a close-up look at different species and lessons on owl behavior, habitat, and more. Birdsacre is home to permanently injured birds that are unable to survive in the wild, including some that help educate the community about the unique and amazing qualities of their species. Don’t miss Owl Tales presented by Connecticut Audubon at the Center in Fairfield, 10:30 a.m. on May 14, 2016. Kids can meet the center’s nonreleasable owls up close then head into the woods to look for signs of wild owls. All ages are welcome, but children must be able to sit on their own during the talk. Pre-registration required: 203-259-6305, ext. 109. Get tips on raising the next generation of outdoor enthusiasts in the Great Kids, Great Outdoors blog and find trip ideas in AMC’s community for families, Kids Outdoors.